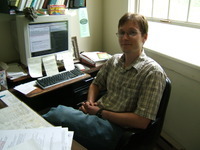 Scott Monroe of the Stowe Reporter emailed yesterday to say he started a new blog, called The Blotter. He's still updating the paper's other active blog, 49 School Street. I was driving through Stowe yesterday and thought I'd stop by to see Scott, because we'd never actually met in person. Lucky for me he was in the office. He gave me a tour of the Stowe Reporter HQ, and we talked about blogs and newspapers and I told him I liked the quote on his office door from William Zinsser's On Writing Well. Also, I took this fabulous picture. On his new blog, Scott will be posting the weekly Stowe police blotter. He also plans to offer insights about the public safety stories he writes for the paper, stuff he doesn't have room to print. Has the potential to be juicy, if he manages to keep up with the workload! It's tough to blog and write for the print paper. I know — wah wah, poor reporter! — right? But all this writing adds up to time we don't spend interviewing people or writing our stories. It's a lot of work to do both well, especially since our online activities are for now mostly experimental — i.e. not compensated in the same way. So I have a lot of respect for reporters who are pushing the boundaries and trying new things. You can bet that most of them, especially in Vermont, are doing it because they love it, not because they're making the big bucks. I guess we're also doing it because we have to. I know I feel a sense of urgency, like I need to be experimenting if I want to have a job in 5 or 10 years. Anyhow, it was good to meet Scott, and to see that even a new media pioneer like him still carries a reporter's notebook in his back pocket. "I always feel naked without it," he told me. Yeah, me too.